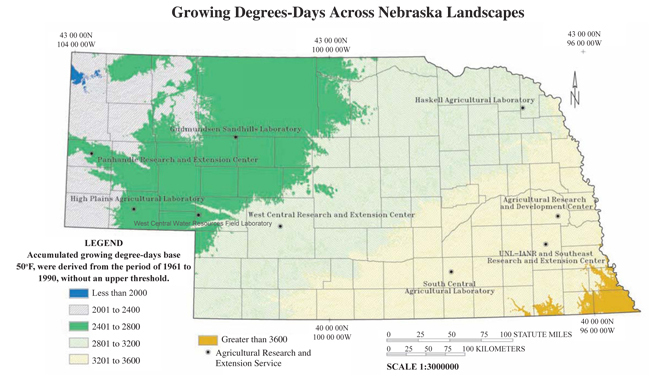 This NebGuide provides information useful in assessing accumulated growing degree days, soil type and field conditions, average precipitation, and the field’s microclimate when determining seeding rate for dryland corn. Differences in climate between Lincoln and Scottsbluff are as great as from Lincoln to the East Coast of the United States. These climatic differences across the state greatly affect recommended seeding rates for rainfed corn in Nebraska. 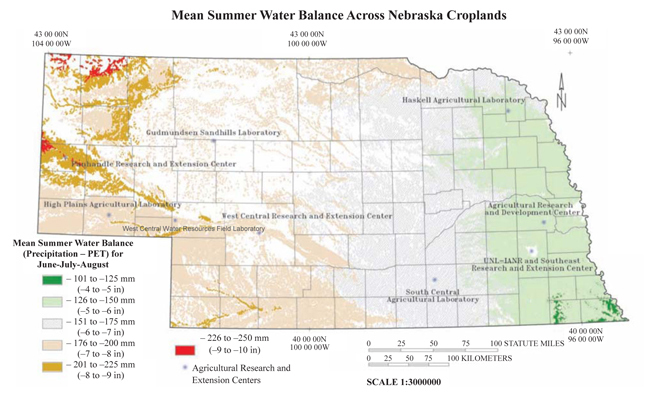 The mean summer water balances (the cumulative differences between monthly precipitation and potential evapotranspiration for June, July, and August) across Nebraska are illustrated in Figure 1. These values range from a deficit of 4 inches in areas of southeast Nebraska to a deficit of as much as 10 inches in portions of northwest Nebraska. The water balance for June, July, and August assumes 100 percent effective rainfall; however, warm season rainfall on bare soil can be as low as 20 percent efficient due to evaporation, runoff, and weed use. Total crop water use for a crop also must include the time from plant establishment to maturity. When you also consider differences in soil types, depth of soil, growing degree days (Figure 2), row pattern, plus the many other variables that affect crop production, you begin to understand the need for a wide range of seeding rates for rainfed corn in Nebraska. Optimum seeding rates also are affected by the hybrid selected. This includes the relative maturity, stress tolerance, prolificacy, and stalk lodging resistance. Full-season hybrids have the greatest yield potential. A mid-season hybrid at one location may be a full-season hybrid at another location since season length varies greatly across the state. The length of the growing season is affected not only by the number of days from the last frost in the spring until the first frost in the fall, but also by latitude and altitude. In addition, the field microclimate associated with residue cover greatly influences plant response to climatic conditions. At planting, the only real guides to the crop year are the amount of stored water in the soil profile, the amount of crop residue, and planned tillage and cultivation. Within limits, these can be used to help decide how late the hybrid maturity should be. The more stored soil water available, the later you can stretch the maturity range in hybrid selection. However, use this recommendation cautiously and avoid going to the extremely long hybrids unless you are ready to assume the risk of a crop badly damaged by early frost or drought. The amount of crop residue present at planting and maintained during the growing season affects soil moisture. In general, increasing quantities of crop residue will reduce soil evaporation and wind speed, increase water infiltration, and decrease water use by weeds through suppressed growth from competition. Maximizing rainfed corn yields in Nebraska usually requires 4,000-6,000 lb of crop residue per acre. Full-season hybrids also are more risky when high plant populations are used. With a greater amount of soil water at planting, it is usually preferable to increase the planting rate rather than switch from a mid-season to a full-season hybrid. If full-season hybrids are used, reduce the plant population. Generally, for every four-day reduction in hybrid maturity, 1 inch less water is required. However, this large amount is only true in well-watered conditions. For example, studies conducted with adequate soil moisture have shown that with a 2,400 or less Growing-Degree-Day (GDD) hybrid, optimum harvest population was above 30,000 plants while with a GDD hybrid of 2,700 or more, the optimum harvest population was 26,000 plants. The GDD concept was developed to help rate corn maturity. Seeding rates for corn in Nebraska under rainfed conditions have ranged from approximately 8,000 to 27,000 plants per acre. Water requirements of corn only decrease if the population is less than 18,000 plants per acre. Corn yields increase from 6 to 12 bushels per acre for each additional inch of soil water beyond the 8-11 inches needed for initial grain development. Many agronomists feel that maximum production is reached with a 0.5 pound ear weight with row spacings of 20-36 inches. The skip-row system — with plant 2 skip 1, plant 1 skip 1, and plant 2 skip 2 — probably increases to 0.6 lb ear. Under dryland conditions, an ear weight of 0.6 lb or even 0.7 lb in a skip-row system may be a more desirable goal in areas with a longer growing season. But in areas such as the Nebraska Panhandle, a 0.4 lb or 0.5 lb ear in a skip-row system may be optimum on a year-to-year basis. This would provide some insurance if a drought occurred. Table I lists the harvest plant population needed for yield goals from 40 to 170 bushels per acre based upon ear weights of 0.4 and 0.6 lb. Table I. Yield goal vs. plant population at harvest. Figure 3. Range of yields for various plant populations and available soil water at Sidney, Nebraska. Extremes on each bar encompass the range between minimum and maximum values. Extremes of the colored section of each bar encompass the range between the 25 and 75 percent quartiles, and the horizontal line within each colored section shows the median. Figure 5. Skip-row rainfed corn 2005 — Trenton, Nebraska. 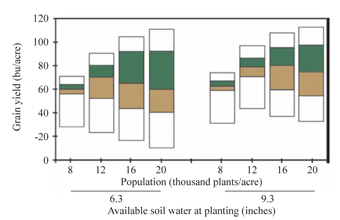 Simulations had one of three levels of available soil water at planting, either 3.1, 6.3, or 9.4 inches in the top 5 feet of a loam soil, representing one-third, two-thirds, and full soil water profiles, respectively. At Sidney, Nebraska, median yields (half of the yields are greater than the median and half are less) were maximized at 8,000, 12,000, and 16,000 established plants per acre for starting available water levels of 3.1, 6.3, and 9.4 inches, respectively (Figure 3). Gross margins were maximized at 12,000 established plants per acre when starting available water was 6.3 or 9.4 inches. 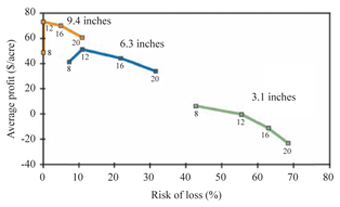 The probability of a financial loss at this population was reduced from about 10 percent at 6.3 inches to 0 percent at 9.4 inches (Figure 4). When starting available water was 3.1 inches, average gross margins were less than $6.10 per acre and risk of financial loss exceeded 40 percent. Median yields were greatest when starting available soil water was 9.4 inches; however, perhaps the greater benefit of additional soil water at planting was a reduced risk of financial loss. Skip-row is a practice that can increase the success on rainfed corn if one has at least 4,000 pounds of wheat residue (the residue from a 40 bu wheat crop — spread evenly). A stripper header improves the value of this residue because it lasts longer. This residue reduces soil water losses from evaporation, and the residue also suppresses weeds, which can be a major problem with skip-row systems. You do not benefit from crop competition in helping control weeds in the skipped rows because the canopy never closes, but in the planted rows you do get help controlling weeds because of the higher plant population, which provides more crop competition. The idea behind skip-row planting is to keep developing corn plants from using all of the available soil water too early in the growing season. Because water in the soil between widely spaced rows cannot be reached by the plants until later in the season, soil water is available to plants in July and August when corn enters the reproductive stages of growth. Corn is more sensitive to drought in the silking to blister stage of development. The first research with skip-row corn in Nebraska was started in 2003. In this trial, all rows of corn were planted and then plants were removed to reduce population, or one or two rows were removed on July 2. By this time, the corn had used 6 inches of soil water. A breakdown of yields from this trial follows: (1) Control (19,500 population): 41 bu/ac; (2) removing approximately every third plant (14,700 population): 41 bu/ac; (3) removing every other plant (11,200 population): 45 bu/ac; (4) series of two rows of corn followed by one row removed (equivalent to 13,800 population): 48 bu/ac (17 percent above the control); (5) a series of two rows of corn with the next two rows removed (equivalent to 9,500 population): 54 bu/ac (32 percent above the control). 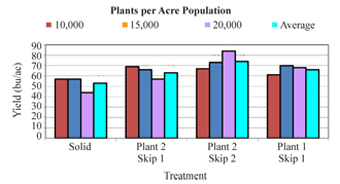 Figure 5 shows the results of research with skip-row rainfed corn at Trenton. The plant 2 skip 2 averaged 74 bushels versus 53 bushels for the solid (every 30-inch row) planting. The largest yield advantage was at the high population of 20,000 (40,000 in the planted rows in the plant 2 skip 2) versus the solid planting average 44 versus 84 bu/ac in the plant 2 skip 2. Check with your Farm Service Agency and Crop Insurance personnel before adopting skip-row. Twenty-three field trials were conducted across the central Great Plains from 2004 through 2006 to quantify the effect of various skip-row planting patterns and plant populations on grain yield in rainfed production. A significant pattern by plant population interaction was observed at only one of 23 trials, suggesting that plant pattern recommendations can be made largely irrespective of plant population. In trials where skip-row planting patterns resulted in increased grain yields compared to the standard planting pattern treatment (every row planted using a 30-inch row spacing), the mean grain yield for the standard treatment was 44 bu/ac. In those trials in which skip-row planting resulted in decreased grain yield compared to the standard planting pattern, the mean yield was 135 bu/ac. From these trials, the plant 2 rows, skip 2 rows planting pattern is recommended for risk-averse growers in the central Great Plains where field history or predictions suggest likely grain yields of 75 bu/ac or less. Planting 1 row and skipping 1 row is recommended for growers with moderate risk-aversion and likely yield of 100 bu/ac or less. Some of these sites did not have at least 4,000 pounds of crop residue, which limited the use of skip-row because of the increased soil water losses from evaporation. The success of skip-row increases with increasing crop residue levels. For additional information see the online Crop Management Paper – Skip-row Planting Patterns Stabilize Corn Grain Yields in the Central Great Plains. See Table II for planting rates, row widths, seed spacing, and harvest population and Table III for suggested harvest populations for moisture and residue conditions when planting on silt loam soils. Remember, lower plant populations are not as competitive with weeds. Table II. Average planting rate, row width, seed spacing in inches, and projected harvest populations for corn. Table III. Suggested harvest populations for moisture and residue conditions at planting on silt loam soils in Nebraska. Even distribution of residue is assumed. With 2,000 lb/ac wheat residue or 4,000 lb corn/sorghum, or 55% residue cover and 2 feet of subsoil moisture. 3,500 lb/ac wheat residue or 7,000 lb corn/sorghum or 90% residue cover and 4 feet of subsoil moisture. 5,000 lb/ac wheat residue or 100% residue cover and 6 feet of subsoil moisture. 100 lb of residue are produced for each bushel of winter wheat and 50 lb of residue are produced for each bushel of corn or sorghum produced. For continuous no-till, the residue could be a combination of the winter wheat residue and corn or grain sorghum residue. Requires equipment that can plant or drill through residues. Long-season corn hybrids are not recommended. If used, reduce plant population.